Is there any plans for Lenovo to release a BIOS with overclocking options for the W520? It's very nice to buy the 2920XM only to find out that the extra $400 was useless. Unlikely. Lenovo didn't do anything special about W700 or W510/W701 with Extreme Edition CPU's. Nevertheless, ThrottleStop works on these platforms and enables the clock adjustment of Extreme Edition CPU's in Windows. Thanks for the info hazard. I'm downloading ThrottleStop right now! Would you mind expounding a little bit on the need for something like throttlestop? I am waiting for a w520 with the xtreme processor and am surprised to hear that it has no benefit over the 2820. What exactly does that mean? The cpu never really gets to go fast? Huh? Well, you won't be the only one unhappy dude. ThrottleStop doesn't help one bit. The whole point of the 2920XM is for the OCing. I'd cancel the order if it's not too late. The 2 yr old Alienware and 3 yr old Dell M6400 at work are both faster/as fast as this. I'm a huge Thinkpad fan(4/4 of my laptops are Thinkpads, my desktop keyboard is the thinkpad keyboard! ), but this purchase is just SO disappointing that I think I will be jumping ship come next >$2000 laptop purchase. Lenovo is simply not up to the task. Well the new machine got here today and it does, absolutely blow my old Dell XPS m1710 out of the water. I ran the benchmark that came with the mathematical software I use, first on the Dell then on the Lenovo. The Dell scored in the middle of the pack and the Lenovo was so far ahead that it actually made me burst out laughing. A picture is worth a thousand words. 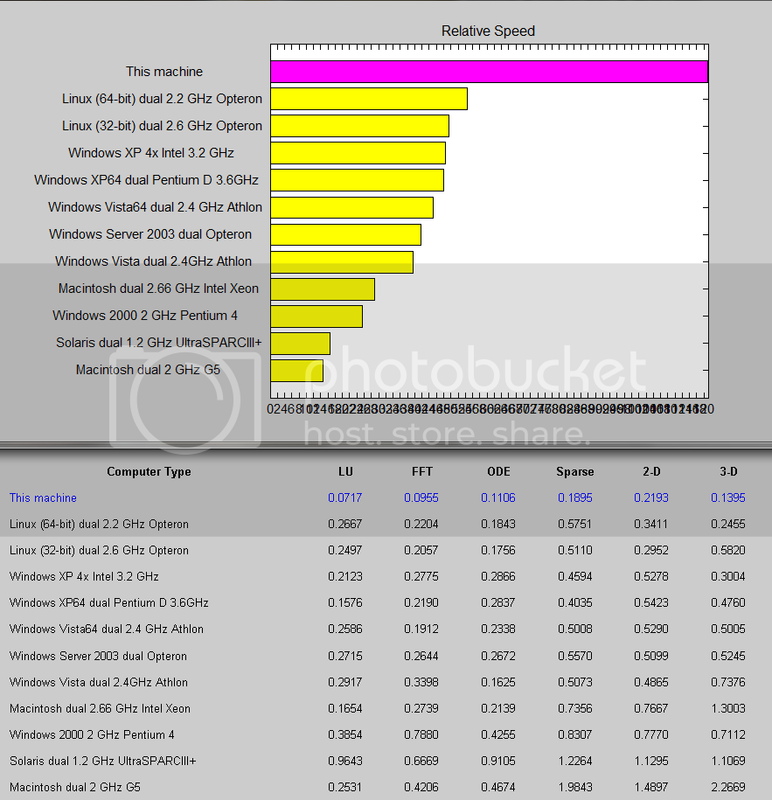 I performed a benchmark with the numerical/graphical software I use. 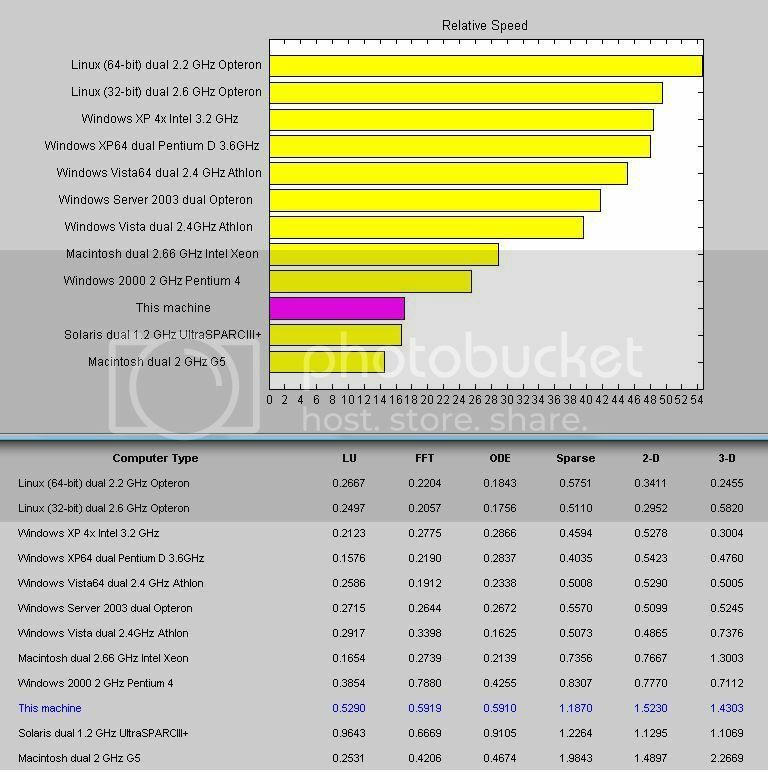 The Benchmark is built into the software, with a database of computers to compare against.. I am one happy dude! Moderator Note: Image size > 50k, converted to link(s). If you ordered the W520 with the 2820QM cpu you would have gotten the SAME order of magnitude of improvement. for $400-$500 less. Also notice the list of CPUs on your graphs are............older than your old laptop..